February 7, 2017 . Review by Editor. 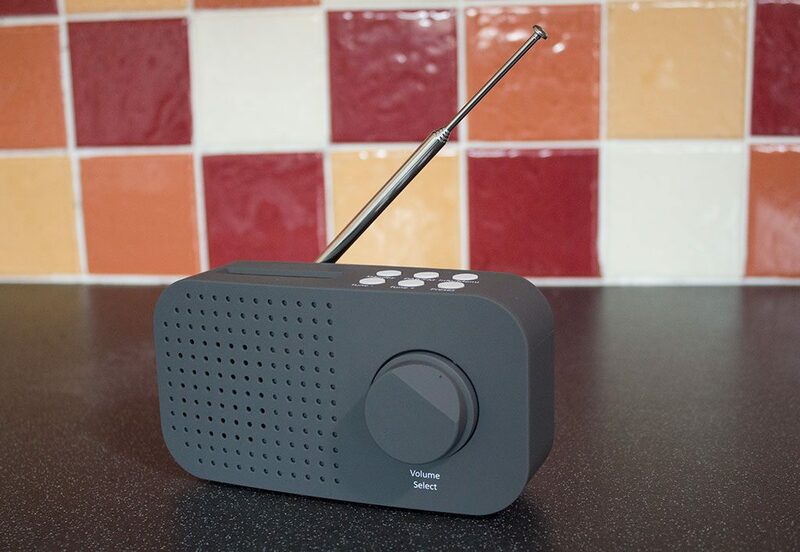 The Tesco DR1403 is a cheap and cheerful DAB/FM radio. Sound and reception are reasonable from this small package. The Tesco DR1403G is one of the cheapest portable digital radios on sale today. It receives DAB and FM radio stations, has easy to use controls and a clear display. In the box is the radio itself, a USB power adapter and USB lead and a fairly comprehensive instruction leaflet. Unfortunately the Tesco DR1403 cannot receive DAB+ stations, which means it doesn’t have the Digital Radio Tick Mark. There are several radio stations broadcasting in the UK using the newer DAB+, such as Union JACK, Magic Chilled, Fun Kids and Jazz FM. On first impressions the radio is smaller than you might expect – especially if you ordered online and have other portable radios in the home. It feels sturdy and well made with a matt surface finish. Altogether this makes the radio feel as if it cost more than £24. The loudspeaker is behind an dotted speaker grille on the front of the set. A rotary knob, which turns continuously, is used to change the volume. The same knob pushes in to select stations and menu options. Buttons for the various functions, including power on/off, are found on the top of the radio. The two line display is situated to the left. The display is far from flush with the top of the radio, which makes it hard to read the scrolling text unless you are looking directly from above. A battery cover, headphone socket and power socket are found on the rear. The DR1403 comes in four colours: red (model number DR1403R), turquoise (DR1403T), grey (reviewed here, DR1403G) and blue (DR1304B). The colour and matt appearance, as well as the rotary dial and flush speaker grille on the front, mean it belies its sub-£25 price tag. 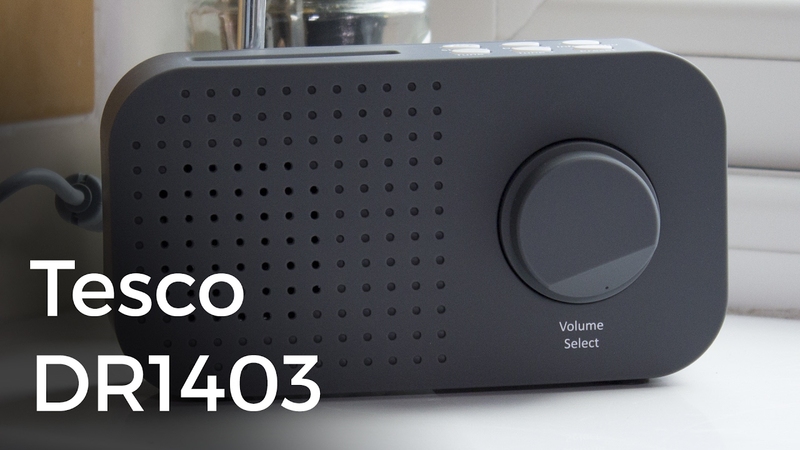 The Tesco DR1403 is a no-frills DAB and FM radio which is ideal for small kitchens and bathrooms. It can be powered with the supplied USB power adapter or four AA batteries. The USB cable is a generous length which makes positioning the radio for the best reception easier. Buttons for standby, DAB/FM modes, info and menu, tune up, tune down and presets are all on the top of the DAB radio. The standby button has an impressed power icon, but otherwise the buttons are all identical. The buttons click firmly when pressed. Ten presets can be accessed through the presets button. As the number of digital radio stations increases this is quite useful, but access is not as quick as dedicated preset buttons would be. The station name and scrolling text are shown on the two line display. The text is quite small but easy to read and the display is backlit for increased clarity. Stations on FM are also shown with the station name and scrolling text. Some more expensive digital radios require changing the display mode to see the scrolling text and don’t have a backlit display, so this is certainly a positive. Unfortunately the LCD display itself is recessed considerably which makes it difficult to glance and see the station name or text. At a distance of four feet with the radio on a table or windowsill it’s almost impossible to see any of the text. The radio is light enough to tilt though for a better view. There are no icons for battery life and signal strength. A telescopic aerial can be extended and positioned at almost any angle. When switched on for the first time the radio will automatically scan for all digital stations. In our test location it only picked up 11 stations where most digital radios find 60 stations. With the radio moved a few feet to another location it did find the national BBC and commercial stations as well as local digital stations. Reception disappointed slightly with FM stations. The radio couldn’t pick up local FM radio stations during a scan, but did lock onto them and pick up the station name when tuning manually. Digital performance is on par with the Pure One Mini Series 2, but not as good as the Sony XDR-S40DBP. We haven’t tested any other radios which failed to lock on to an FM signal in our test location, but if you know the frequency of your chosen station this isn’t a major inconvenience. The Tesco DR1403G has a single 1.5W RMS speaker which performs equally well with music and speech programmes. The sound doesn’t distort at any volume, which goes fairly high for a radio of this size. Speech and talk radio sounds quite clear and the speaker easily fills small rooms. Music sounds reasonable on stations from BBC Radio 1 to Planet Rock. It’s fair to say the radio doesn’t offer the sort of listening experience you can get with a mid-range DAB radio. In a busy house it has a bit more volume to give than the more expensive Sony XDR-S40DBP. There are no adjustments for treble or bass – just the large volume control on the front of the radio. A 3.5mm headphone jack is provided on the rear of the radio. Tesco’s DR1403 is one of the best looking digital radios for under £25 that you can buy today. Most supermarket brand DAB radios are only available in shiny black plastic, but this funky design offers something different. The sound from the radio impressed for the cost, but you may need to experiment with the position of the radio to get all the stations you should be able to receive. It’s good to see a bright two line display on a budget radio, but you almost need to be looking from above the radio to see it. The lack of DAB+ is the major drawback of the Tesco DR1403G. 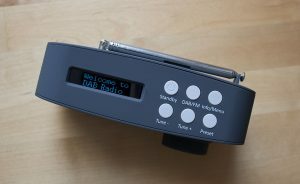 With four national DAB+ stations now broadcasting in the UK with more on the way you may find you can’t receive stations you had hoped to listen to. For this reason we would recommend the Roberts Play 10 and Pure One Mini Series 2 digital radios over this budget Tesco model. 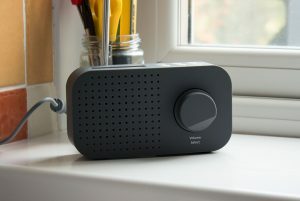 If you’re looking for a new radio for the kitchen or bathroom and will stay tuned into Radio 4 or LBC, which broadcast in DAB rather than DAB+, the Tesco DR1403 is a fine choice.